To celebrate the second Black Mathematician Month, Chalkdust magazine and UCL maths department organised a maths workshop day in Tottenham for 60 Year 9/10 students from 6 local schools. The aim of the day was to highlight the minimal progress of diversity in our field and to improve it in the best way possible. After the success of last year, we were very excited to showcase our passion in Tottenham. We hope that it will encourage young black students to engage more with maths, enjoy it and view it as an important skill for employment. 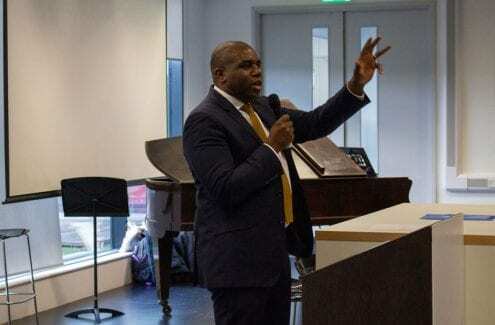 To kick start the day, the MP for Tottenham, David Lammy gave a speech about the importance of believing that you can achieve anything, regardless of what your upbringing may have been like. Lammy spoke of WhatsApp founder Jan Koum, who had to migrate to USA as a child with his parents, who both passed away soon after. Lammy also spoke about the recent Brexit proposal and how his team of researchers were needed to check it and discuss how it would impact the public’s finances. Each of these anecdotes served the purpose of highlighting the significance of maths in life’s difficult situations. 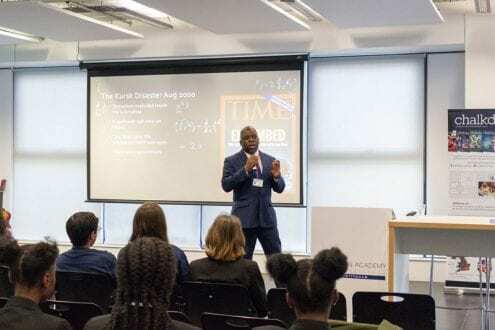 Ultimately, the technological and economic climate is changing quickly, and Lammy hopes that maths students – such as the ones who were sat before him – will be well-placed to lead the way. Keen to remind us that maths isn’t all just formulas, Dr Nira Chamberlain then arrived with an enthusiastic, interactive and humorous presentation about how maths can be applied to the real world. All the students thoroughly enjoyed these talks and could not wait for the workshops. These workshops included fun and intriguing maths ranging from Number Theory, Modelling to Frieze patterns and Topology. They were run by UCL PhD students and Dr Naz Miheisi from Kings college. In the topology class, we made several types of Möbius loops, combined them and understood their properties. A discussion was also held about the Klein bottle and Projective plane. The students were all trying to predict what the different shapes would turn out as, but were completely astonished by the results. Some did say they would make great Christmas decorations! In the afternoon, UCL undergrad volunteers formed a Q&A panel to answer numerous, interesting and funny questions from the pupils, some including about turning up to lectures! On a serious note, the students did find this very helpful and informative, further establishing whether maths is for them. To round off the day, there was a question relay between schools where the winning team got their very own Chalkdust T-shirt. The pupils did get competitive against each other, albeit for the love of maths! For me personally, I loved this whole day and the idea of inspiring the next generation felt very rewarding and I will be hoping to do more outreach events like this in the future. To conclude, thank you to London Academy of Excellence for hosting the event. The feedback from the schools shows that they thoroughly enjoyed the day and that it will really influence their pupils’ future decisions. After all, that’s what this Month is all about! 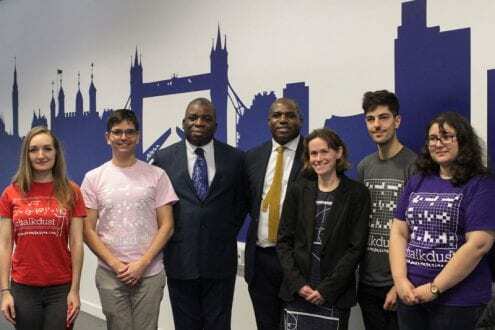 This July, University College London (UCL) hosted the first ever Science and Technology Facilities Council (STFC) summer school in Artificial Intelligence (AI) and Machine Learning. 120 PhD students from universities across the country were brought together to spend a week and a half learning about the forefront of AI technology. With lectures from several industry leaders; including Intel, NVidea, ASI, and Dell, the summer school aimed to give a solid grounding in the basics of machine learning before providing a glimpse into some of the latest technologies now being applied. This included being granted access to some of the best interactive platforms currently available; and allowed students to follow along with demonstrations during the lectures. To start with, ASI’s ‘SherlockML’ enabled students to familiarise themselves with the most common tools used in machine learning. By making use of the Intel ‘DevCloud’, students were then shown how to optimize Neural Networks in TensorFlow and Caffee, before learning about computer vision and making use of the Movidius stick to be able to turn a webcam into a tool to classify everyday objects. NVidea also demonstrated how to make the most out of currently available computing clusters, using Graphics Processing Units (GPUs) to parallel process tasks, and students were taught how to build a convolutional neural network in ‘Digits’ which could then classify whale faces. On top of the extensive technical training there were additional guest lectures highlighting how machine learning can be applied to a variety of different fields, from high energy physics and astrophysics to in industry. 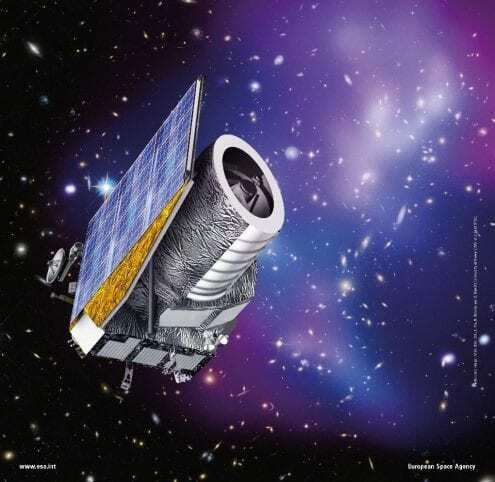 It was also made evident how machine learning techniques will be vital in the future of astronomy with new methods such as gravitational waves and new observatories like the Square Kilometer Array (SKA) which will produce petabytes of data every day. Over the weekend a further 100 sixth form pupils were invited to take part in a hackathon-style event lead by the visiting PhD students, where during the afternoon the students demonstrated how machine learning could be applied in a real research scenario at the Large Hadron Collider (LHC). One of the best things about assembling people from such a wide range of disciplines, with a common interest in machine learning and AI, was the incredible diversity of the work presented. Over the course of three poster sessions, we had the opportunity to discover what was being researched; from classifying solar winds and galaxies to using neural networks for novel detection methods in the LHC. And for one evening, this was combined with a chance to meet and talk with professionals from various CDT industry partners with companies like ASOS, TFL, and NCC Group. As well as networking with the industry partners, a key aim of any summer school is to develop links between the students themselves. Although never an issue when helped along with some free food and drinks, it was especially encouraging to see everyone come together for the quiz night, with each team setting a round of obscure questions, and the school ended in spectacular fashion making use of the record-breaking summer with a river cruise BBQ on the Thames. 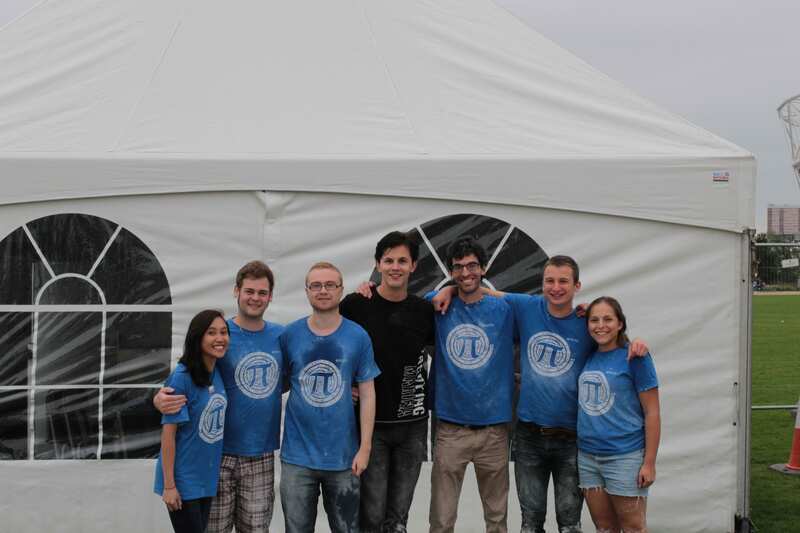 The Summer School was directed by Jonathan Tennyson, and the LOC/SOC included Tim Scanlon & Jason McEwen (CDT Research Directors), Jaini Shah (CDT Manager), and Nikos Konstantinidis & Ofer Lahav (CDT co-Directors). In 1999 the physics community was stunned when it was discovered that far from slowing down under the pull of its own gravity, the universe is actually expanding at an accelerating rate. This is the cosmic acceleration problem and it poses one of the largest challenges in physics today. 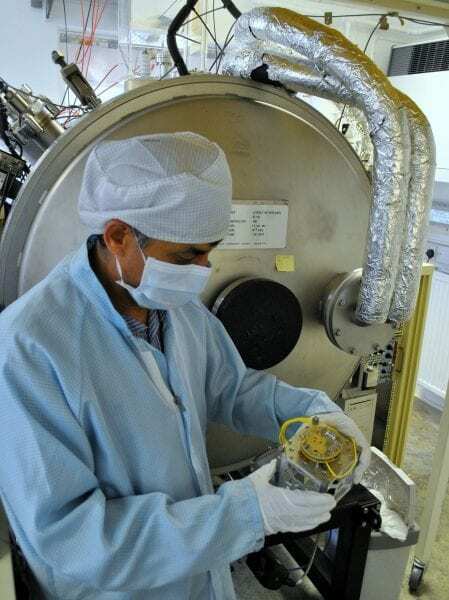 Here, at UCL’s Mullard Space Science Laboratory (MSSL) we are leading the effort to find a solution. 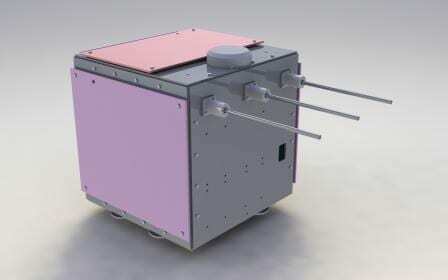 Parts for the Euclid Satellite, which will conduct a massive astronomical survey, are being built on site. Meanwhile we prepare for the arrival of the groundbreaking Euclid data by developing and testing techniques to distinguish between theories of cosmic acceleration. We take advantage of an effect of Einstein’s theory of general relativity called gravitational lensing. As light from distant sources travels towards Earth, it is deflected by the gravitational attraction of intervening mass slightly distorting the shape of the observed image. This effect is normally very small, but by measuring the shape of billions of galaxies, amazingly we can statistically differentiate between theories. This type of analysis has been conducted before, but to get the most out of next generation experiments we must hone our methods. When comparing the two leading statistical techniques, we found both have serious drawbacks. Nevertheless we have shown that the two methods are just special cases of a more general theory: narrowing our search for a better approach. Irrespective of the statistical technique that is ultimately used, we must always accurately predict the lensing signal to compare to the real universe. An intermediate step involves determining the power spectrum that describes the ‘clumpiness’ of matter on different length scales, at different times. We are working on a publicly available code that will help researches who generate these spectra determine whether their output is accurate enough to meet the needs of upcoming lensing experiments like Euclid. Gravitational lensing is very a delicate business. Large collaborations must identify, understand and mitigate annoying instrumental and astrophysical effects that contaminate the lensing signal. UCL is leading the charge in preparation for Euclid’s launch in the early 2020s. Why is the universe speeding up? The Dark Energy Survey aims to answer that question, and UCL astrophysicists are heavily involved in the collaboration. This film explains the project – and features Prof Ofer Lahav (UCL Physics & Astronomy), one of the leading figures of the DES science programme. This is all maths. Honest. On the Sunday and Monday of the August Bank Holiday, UCL held its inaugural Spark Festival at the Olympic Park in Stratford. Filled with stalls representing research from across the STEM subjects (Science, Technology, Engineering and Maths), it was designed to inspire children to become the scientists of tomorrow. In 2012, athletes from across the world dived into the 50 m long swimming pool nestled within the streamlined Aquatic Centre of Stratford’s Olympic Park. The British charge, led largely by Rebecca Adlington, stuttered and sank, with only three medals and none of them gold. 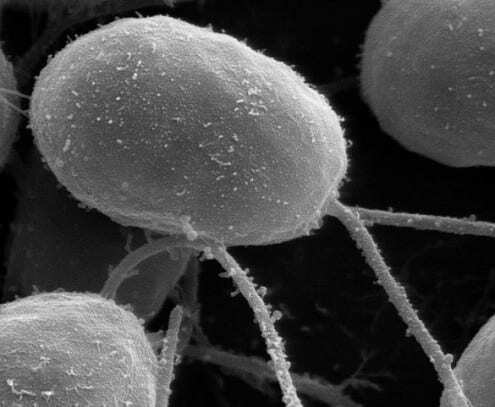 But even they have an easier time swimming than the smallest organisms that inhabit our planet, for whom swimming in water is exactly like us trying to move in corn syrup. Hence their development of long tails (or flagella) that they move in a corkscrew movement in order to propel themselves forwards: were they simply to flick their tails one way and then the other, they would end up right back where they started, never going anywhere. Not the best way to win in the race called life. But why swim in a liquid in the first place, when you could just run across it? We’re mathematicians! We don’t really do experiments – unless you count the simulations we run on computers or the thought processes we carry out in the giant hallways of our minds. For sure, we don’t spend our days in the office filling up inflatable paddling pools with dozens of litres of water and a hundred kilos of cornflour, going slowly crazy as we croak out “Corn!” in the manner of Lord Mormont’s raven in Game of Thrones. Which means that we’re not very good when it comes to optimising the area around the pool that should be covered with a tarpaulin, especially when there are kids around. Or, for that matter, figuring out how to pipette food colouring into a cylinder full of corn syrup – probably the stickiest substance known to humanity – and then take out the pipette without removing the food colouring too, when the whole purpose of the experiment is to show that the flow is reversible and that that is exactly what will happen. 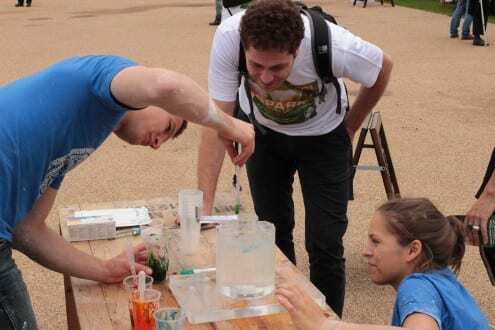 But how else were we to entertain the hundreds of children who attended UCL’s Spark Festival at the Olympic Park over the August Bank Holiday weekend, a two day extravaganza of stalls showcasing an eclectic collection of research being done in the STEM subjects? And so there we were, surrounded (hopefully) by the young scientists of the future, who were excitedly mixing vials (plastic cups) of sticky food dye together; transferring the semi-solid, semi-liquid mixture of cornflour and water from one bucket to another (and, obviously, to the ground as well); excitedly jumping up and down on the surface of this non-Newtonian fluid in our paddling pool (or falling down in it); whilst we were trying desperately to convince them and their parents that this was indeed all maths. Which, of course, it is. Our mixture of cornflour and water (also known as oobleck) is an example of a non-Newtonian fluid: where the viscosity (the fluid’s “thickness”) is not constant as it is in air or water, but either increases (as in our case) or decreases (paint, ketchup, toothpaste, blood) as you apply a force to it. The study of these substances is important (or so we tell ourselves) and mathematicians play a key role in modelling their flow to predict what they might do in certain situations. Shear thickening substances such as ours, for example, are being used to develop the body armour of the future. is very low. In our Taylor-Couette experiment, this was because the viscosity was very high; but mathematicians use the same equations to model the flow of lava (also high viscosity) or the motion of glaciers (low typical speed) or, yes, the swimming of microbes in water (small length scale). Even if we did have to spend Tuesday morning on our hands and knees, scrubbing the ground with a broken broom and chipping away at an inch-thick layer of cornflour on the grass, cursing our inability to properly site a tarpaulin. 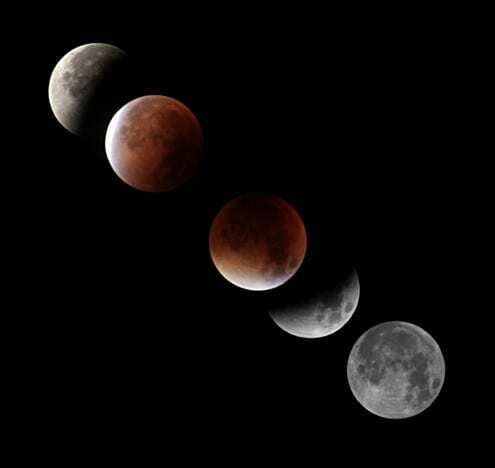 Last night saw both a supermoon (the Moon’s closest approach to Earth, in which it appears about 14% bigger than it does at its most distant), and a lunar eclipse, in which the full Moon passes through the Earth’s shadow. During a lunar eclipse, the disc of the Moon progressively goes from bright white to a deep red: when in the Earth’s shadow, the only light illuminating its surface is the light that is bent through Earth’s atmosphere. This light – effectively, the light of all the sunrises and sunsets on Earth – is red because blue light is scattered in Earth’s atmosphere. This sequence of photos was produced by Theo Schlichter, Computing and Instrumentation Officer at UCL’s observatory, using a Canon EOS450D camera and a 200mm lens. 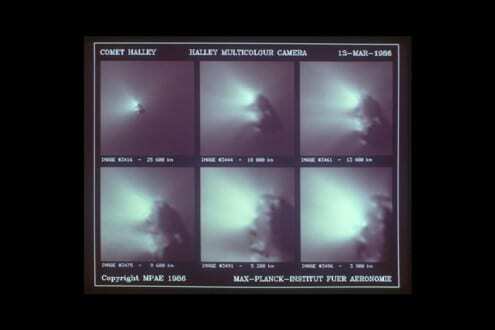 The composite was produced by Dr Steve Fossey.